I liked a lot this hostel! The location is very good, I met great people there and had good nights of sleep as well. It’s clean, safe and comfortable. The lady from the reception, who manages the hostel, is very friendly and extremely helpful. She helped us with everything. And more, I forgot some documents at the hostel and was already in another city, I called her and she sent my documents with someone by boat and in 24 hours I already had it with me. Thanks a lot for everything! I recommend!! The lady in the reception was extremely caring, funny and helpful. My friend forgot his wallet after check out and they made everything they could to help us and ship the wallet to Phuket so that he could pick it up. Hostel muito bom para quem quer ter um lugar muito limpo e confortável para dormir. A host super educada, amigável e disposta, sempre com um sorriso no rosto. Super recomendo. 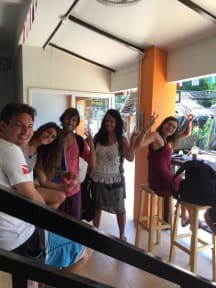 The reason why this hostel is amazing is the incredible host, one of the sweetest person I have ever met! She makes you feel at home and do everything so you can have a pleasant stay. She even gave me a gift when I left! The location is perfect, close to the beach but still very quiet at night. It is very clean and safe also, with AC . The acomodation is basic but I think is the best you can find for this price. Thank you for everything! Hope to see you next time!